The fact that art plays a key role in our lives – enriching both our emotional and social lives – is undeniable. We stand to gain a lot, as individuals and as a society, by engaging more with the arts. Yet, there exists a yawning gap between people and art in our country. The culture of visiting museums is still in its infancy and contemporary art is very slowly capturing the nation’s imagination. The time is ripe to build on this engagement and help bring art not just into the public realm, but firmly into the public consciousness. To not just create awareness, but appreciation. When we think of the art hubs of the world, we are reminded of prestigious institutes like The Louvre or the rustic charm of local artists from Latin America and Europe. But rarely do we think of our own local museums and galleries, throwing open an array of carefully curated artwork and artistic experiences for the general public. Herein lies our closest and most profound avenue to understand and experience art. And its important we help more people realise this. In doing so, we can take a cue from countries around the world where unique initiatives are helping build curiosity and engagement amongst the public for art. In Brazil, for example, one finds the breath-taking open-air museum for contemporary art – Inhotim, which houses approximately 500 artworks across a sprawling 5,000 acres of open land. The pieces are displayed in ways that demand interaction between the viewer and the art. The astounding grandeur of the museum, coupled with its unique approach to art display, a smattering of gourmet restaurants and an entire gamut of cultural experiences make this an all-round attractive option for tourists, art lovers or not! There are also examples of art projects that have deconstructed the entire concept of art viewing and appreciation by merging the very boundaries between art, artist and viewer. The Laundromat Project in New York is turning laundromats into areas of community gathering, art education and public art programs that encourage creative expression in the neighbourhood. While Indian art is now making its mark on the global stage, such efforts would help provide it with much-needed recognition closer home. The St+Art Festival in Delhi recently did this for street art. The festival caught a lot of attention for refurbishing walls in three high-key areas of the city with graffiti, bringing art right into the daily lives of the people. This was also coupled with educational outreach in the form of talks, workshops, documentary screenings, and guided tours where people could learn more about the art. 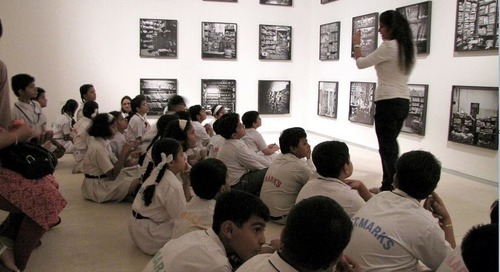 Such knowledge-based initiatives are already being run at several galleries and museums, such as the Kiran Nadar Museum of Art, which holds workshops, film screenings and symposia to educate adults and children alike. All of these are inventive ways in which art is being made accessible and enjoyable to a wider audience. These interventions are a window to a more culturally assimilated society where art plays a central role in free expression and exchange of ideas. This is why its essential and indeed inevitable that art be made available to more people. This need will only continue to grow and such efforts provide a great blueprint for the way forward.